Autumn is upon us… For some who love summer, this is a sad occasion, but I always look forward to the Fall. I love the decorating, the full calendar of events, the dinner parties and nights out for roast dinners enjoy fireside in cozy pubs. It's my favorite time of year! 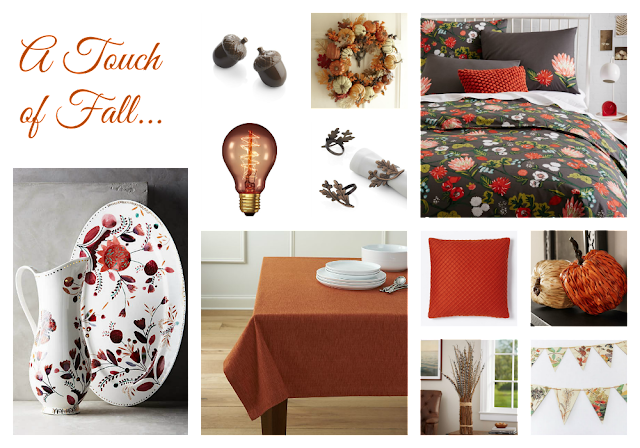 It doesn't take much to embrace Autumn vibes in your home - a new serving dish here, a pumpkin centerpiece there or perhaps just a change of throw pillows to warmer tones from those you use in the summer. These are the pieces that I have my eye on right now for giving a space that little spruce that helps you get excited for crisp, Fall days spent at home!